Our new villa is Villa bukit Lembongan 2. 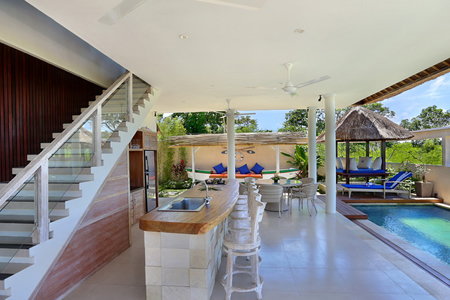 Situated in front of Villa 1, it has a great vibe with an open-plan kitchen and dining area leading straight out into the garden & pool area. The extra large upstairs lounge room has only bamboo blinds and curtains which gives it a Robinson Crusoe feel, like being on a tropical island all by yourself. The upstairs bedroom has plenty of room with a very large king size bed and a smaller single day bed for the young infant or teenager to enjoy. Downstairs there are two separate bedrooms both with a large ensuite, and both bedrooms open up to the Balinese gardens and can be changed from kings to single bedding to suit families or groups. All rooms are A/C and fan cooled. Villa 2 is fully staffed and has the Villa Bukit guarantee, “Totally taking care of you”. Come and enjoy the new Villa Bukit Lembongan with us. Please note, breakfast is not included but for a small cost a delicious Indonesian or American breakfast can be made for you.